U.S. economic officials held the key interest rate steady at a near-record low level Wednesday, but said the case for raising rates "has strengthened." A man walks past an electronic stock board showing Japan's Nikkei 225 index, left, that fell 80.18 points or 0.5 percent to 16,411.97 at a securities firm in Tokyo, Sept. 21, 2016. The Fed decision follows debate by leaders of the Bank of Japan, which sets policy for the world's third-largest economy. 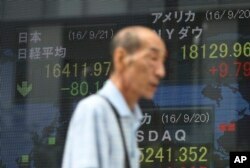 World stocks rose Wednesday after BOJ officials adjusted their effort to fight deflation by speeding up economic growth. The complex program puts more focus on very low long-term interest rates and continues efforts to make it easier to borrow money to start businesses and buy homes. Central bank officials in Washington, Tokyo and elsewhere are coping with slowdowns in global growth and international trade, according to the Organization for Economic Co-operation and Development. On Wednesday, OECD experts published a new study that said the global economy is set to expand 2.9 percent this year, and 3.2 percent in 2017. That is about one-tenth of a percent slower than prior expectations. OECD experts say low growth has disappointed consumers and investors for some time, and their lowered expectations are hurting future investment and consumption. The data also show faltering international trade, which hurts economic growth.